Simple Valentine Heart ~ The perfect project for the beginner. 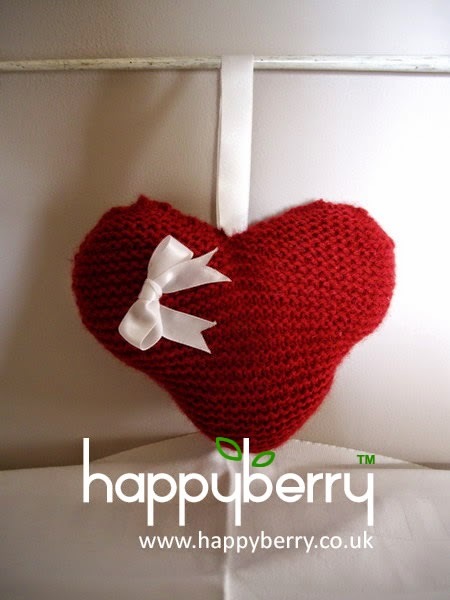 This perfect little gift for Valentine’s Day is knitted entirely in garter stitch, every stitch and row knitted with a plain knit stitch. No purl knitting is involved. This is where it gets a little more interesting. Put RH needle into your left hand. Now you are going to increase the stitch count to 4 by making an extra stitch in each of the 2 sts on your LH needle. Now it is time to divide the knitting to form the top two curves of the heart. Knit 16 sts, then knit 2 stitches together. This is done by putting your RH needle into the next 2 stitches together, (Fig. 14) and knitting them in the same way as before. Knit one further stitch. You know have 18 stitches on your RH needle. Turn your work, so you know have these 18 stitches on your LH needle, and knit all 18 stitches. Leave the other 19 stitches on the LH needle. These will be knitted later. Now knit 15 stitches, Knit 2 tog, then knit 1. Turn and knit these 17 stitches. From now on you will be decreasing a stitch at both ends of the next and every alternate row. Insert your RH needle into the first of the 19 stitches still remaining on your LH needle and wind the yarn round your RH needle. Pull the stitch through, taking care not to pull the unjoined yarn end all the way through. Keep the new yarn end firm, K 2 together then knit 16 stitches. 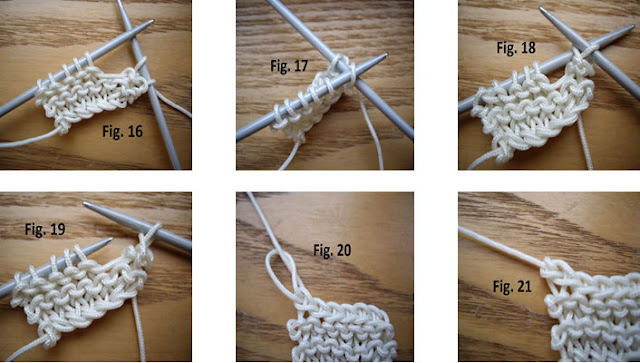 Turn and Knit 18 sts. As you knit the last stitch, pull loose end of yarn tight. Turn, Knit 1, Knit 2 together, then Knit 15. Turn and knit all 17 stitches on the LH needle. Continue knitting to match the other side, decreasing at both ends of alternate rows. Sew two sides together by oversewing edges together, leaving a small gap for filling. Stuff gently and sew up gap. If you want to hang the heart, cut a 6” length of ribbon, fold in half and sew the ends into the top of the heart before you sew up the stuffing gap. Using the same ribbon, thread a 6” piece through the top of one of the curves, and tie in a bow. Trim ends. If lavender is in season, add this to the stuffing to give a beautiful scent. You now have a lovely little Valentine Heart. Author: Knitting Designer Deborah Reader at HappyBerry. © HappyBerry This pattern can not be reproduced in any way without credit given to HappyBerry. This includes copying and pasting into another blog or website, and filming the pattern for use on YouTube. You can however print it off for personal use or for use in a knitting group. Thank you. Can you really believe that Valentine's Day is just around the corner? 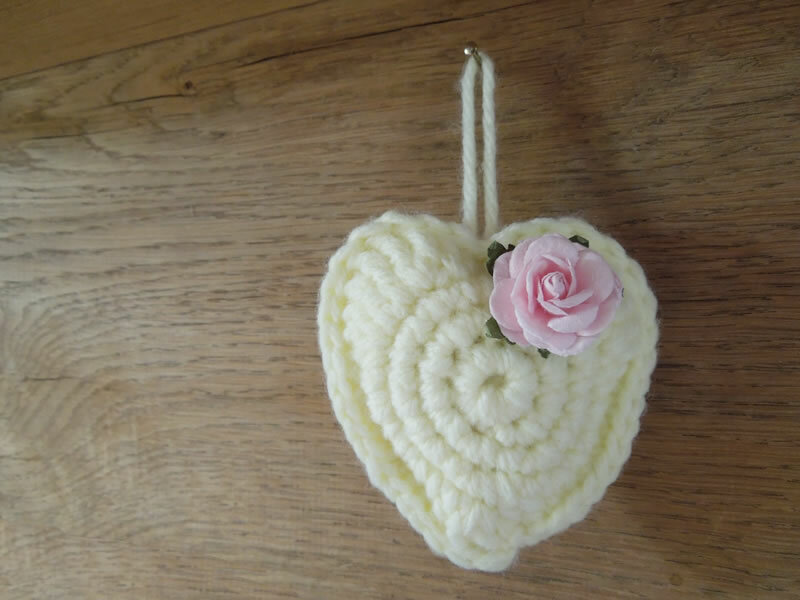 I think the older I get the quicker the years run by but never the less, you can't crochet enough hearts, no matter what time of the year it is and this one is a treat! 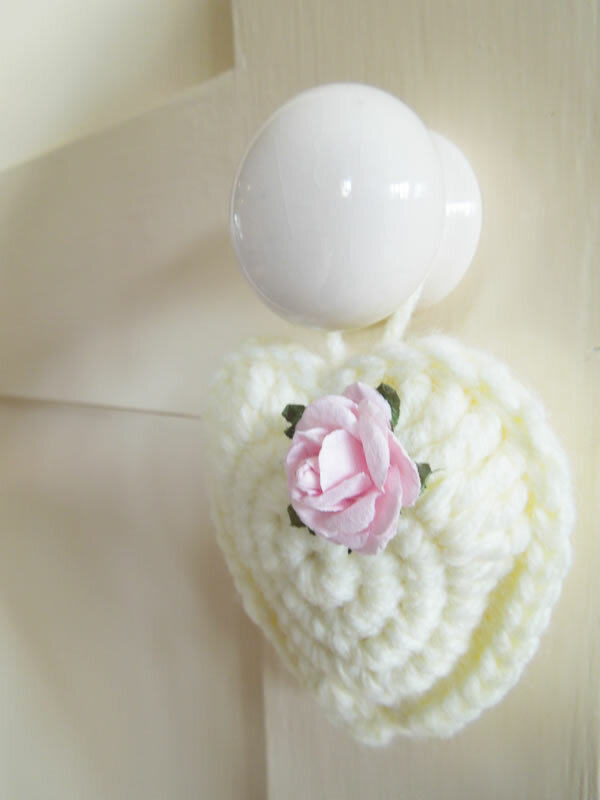 This love heart is crocheted twice and then padded and sewn together. 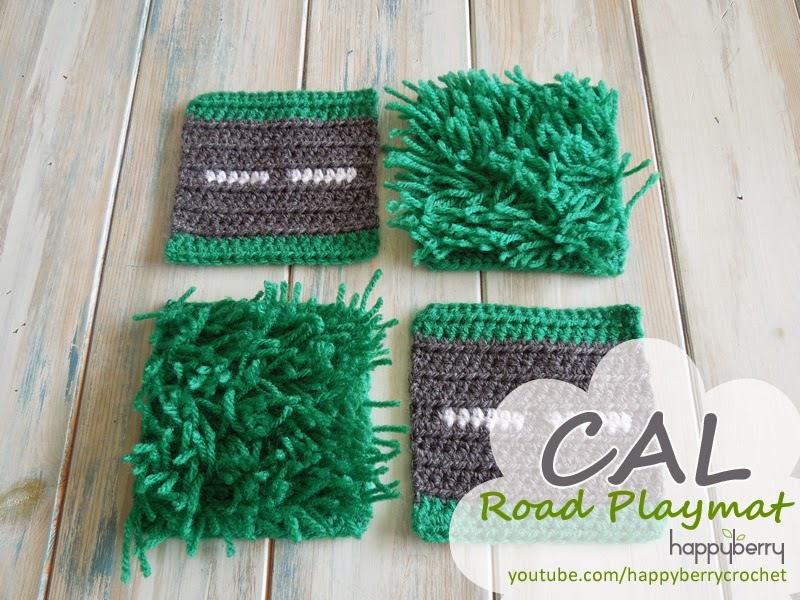 - Some toy stuffing but you can also stuff your heart with scraps of yarn. 1dc in next st, 1hdc in next st, 2sc in next st, 1sc in next 2 sts, 2sc in next st, 1sc in next st, 1hdc in next st, 2dc in next st, 1tr in next 2 sts, 2tr in next st, 1dc in next st, 1sc in next st, sl st in next st, 1sc in next st, 1dc in next st, 2tr in next st, 1tr in next 2 sts, 2dc in next st, 1hdc in next st, 1sc in next st, 2sc in next st, 1sc in next 2 sts, 2sc in next st, 1sc in next st, 1hdc in next st, 2dc in next st, sl st in next st regardless of round and fasten off. Repeat the same instructions to make a second heart, now sew your two hearts together (how romantic) making sure to stuff your heart as you go. Hide your tails inside or use them to make a loop to hang your heart from. Why not also add some extra appliques such as the pink rose shown which you can pick up from your local cake decoration or craft store. 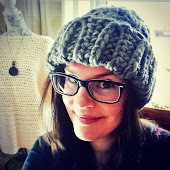 A lot of people ask me if it is worth listing their products or patterns on Etsy as I have a small shop over there and the short answer is yes, it is always worth getting your products out there in all manner of places but will it make me rich quick? well, the short answer to that is probably no. Putting aside the fact that Etsy charge a small listing fee, which I'm not really going to go into whether that is good or bad or whether it is worth it for your business. What is really important is can Etsy make me money. The chances of someone seeing your product on Etsy is pretty small. You need to realise that a lot, and I mean A LOT of people sell their stuff on Etsy. You may feature on their homepage as a new listing for ... oooh .... all of about 2 seconds but the chances of someone specifically searching for your product and then clicking on your listing and then BUYING your product is infinitesimally small. So should I bother I hear you ask? yes! of course you should bother, small is better than nothing of course. The listing fee is extremely small and just one sale will usually cover your initial costs but if the changes are so small why should I bother? Some kind of online presence is better than none but the key thing to do is to link to your Etsy shop from other social networks such as your Facebook page or your Twitter account. Let people know about your shop. Lead people directly to your shop will get your new store much more attention than just relying on the Etsy search feature. However if you want my advice, the best thing to do is start up your own online shop and build your own website, it really is. You will save on all costs, minus some PayPal fees and you can completely make it your own. How on earth...? well it won’t cost you thousands I can tell you that much and it really isn’t that complicated as there are lots of people out there to help you. Ok, it's easy for me as I'm a website developer by trade but even I use the free software that is out there. The first thing to do is register your domain name. You can go for the easiest route on this and head on over to 1and1 and then get yourself some hosting space, that is somewhere to put your website so the world can see it. Think of it like a big drawer, full of your stuff, that the world can see but this drawer needs to be on someone's computer somewhere, usually a big shared chest of drawers, where the world can see it but 1and1 do that too and it doesn’t cost too much. You also want to look for a hosting package that supports PHP. This is the techy stuff that the OpenCart software I talk about below needs to run but your hosting company should be able to help. I then recommend checking out OpenCart free shop software and I’m going to actually put a link to their store here because it is so good and completely free to download and install. http://www.opencart.com/ Any questions you have about installing OpenCart you can either contact 1and1 where it's hosted or OpenCart have a forum and more often than not any questions you have will already have been asked by someone else so you can source answers pretty quickly. OpenCart is great for file download sales such as patterns. They also include features like coupon codes and discounts, social media links, featured products and related products. I mean that's a real quick rundown of getting your own website the cheapest way possible but if you are serious about your business then getting your own website is definitely the way to go but never ever go to a web agency! They WILL cost you thousands and you probably won't get a very good website at the end of it. Just remember that if you have lots of likers on Facebook and lots of followers on Etsy, even subscribers on YouTube, if these websites disappeared tomorrow your business is pretty much dead in the water. But most of all? Don't be scared of building your own website. It doesn't have to launch tomorrow. You should always nurture your own community from your own website as best as you can.